Don’t you be shy, now. Laugh out loud, do not abash. Lick a lolly, share small folly. Make some stew, and make it hearty. How many times have you heard this spoken loudly (word interchangeable, same intention) from a fed-up parent, caregiver or teacher to a child? How many times have you yourself said this or something similar in anger, to a child? Frustration happens when dealing with little ones with strong opinionated minds and limited awareness for time, urgency, consequences or your priorities; it is inevitable. Children can be persistent, stubborn, wild, loud, aggravating, aggressive, irritating, exhausting. Caregivers get fed up, tired, annoyed, irritated, overwrought. They can have bad days with too much to do, too little sleep, too many children to care for, too many demands with too few hands to do them with, too many worries. Crises, emergencies, a clogged sink, a car that would not start, yet another ‘accident’ right after cleaning is finally done … Children, especially young ones, rarely know to take adult burdens and juggling into account. On the contrary, it is as though they are uncannily aware of any lag or energy slump … and if anything, are more likely to be needy, clingy, whiny, and doubly argumentative exactly when you have the least time or energy to spread around … (FYI, it is mostly not done to drive you nuts, but because children may need to reassure themselves even more when you are stressed, that you are there for them: a difficult cycle, when you have to be extra-patient when there is least patience to be found …). Parents and caregivers are human. They make errors. They get upset. They may raise their voice, match their child one to one in volume, heel-digging, and demand. It happens, and as long as it does not happen too often, it can be repaired with comfort and apology, time to reconnect, some soothing, an opportunity to explain and understand. In general, however, children listen better when the volume is set lower. Calm allows the brain to form connections that make meaning, while anxiety and overwhelm awaken circuits of survival while shutting higher learning down. Experienced teachers will tell you that they keep their voice low to keep the children listening: it may seem paradoxical, but in effect it works like a charm. Gentle speaking allows the intonation and cadence of your thoughts to pass through better. It allows the listener to let it in without alarm. It differentiates emotions and helps regulate a child’s understanding of nuance and intention. A raised voice is a good tool for calling an alarm, to keep the child away from danger, to make clear what should not be done to prevent harm. For instruction, though, the raised voice spins way off the target, and misses by a long shot: the meaning of the words you wanted to convey gets lost in the tone and loudness of the sound. We cannot force flowers to grow faster by pulling on the stalks, nor would it help if we stalked constantly, demanding them to hasten. We cannot make a plant drink more by spewing a stronger stream of water–it will only exposes roots and hit raw nerves. 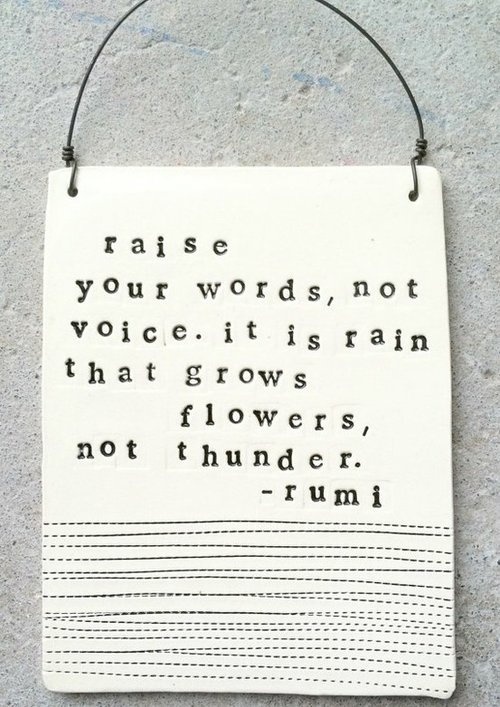 With children, too, we cannot force growth by raising our voice or hardening our words. We’d get a reaction, maybe, but not learning, and we’d shut down tendrils of potential besides. 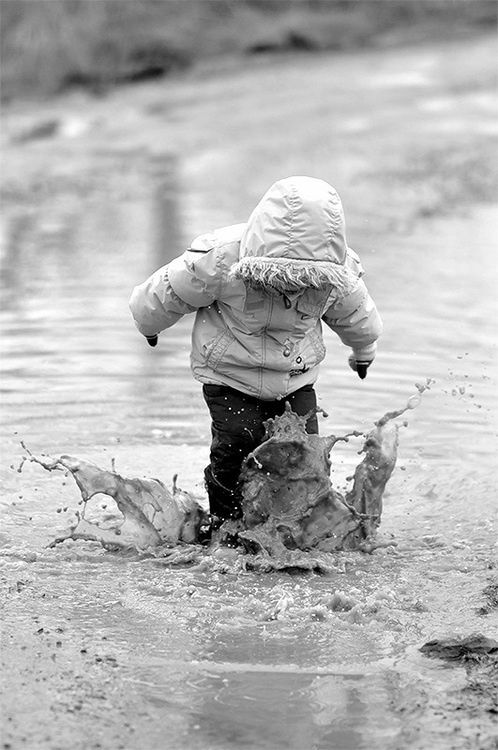 Children, too, grow best in gentle sprinkles, rather than thunderstorms.